« Who’s the Bozo Administering Your Retirement Plan? My introduction to Nelson Nash and the Infinite Banking Concept® was a major turning point in my life. Up until then, I was a business-building consultant to financial advisors. The advisors I coached were always bringing financial products and strategies to my attention, and over the last 25 years, I’ve investigated more than 450 of them. Unfortunately, most turned out not to be worth the paper they were printed on. Finally, one financial advisor asked me if I had ever heard of Nelson Nash, and the book he wrote, Becoming Your Own Banker: The Infinite Banking Concept. I had not, but it sounded very intriguing, so I called and talked to Nelson and ordered a copy of his book. Nelson Nash brings his background as a forestry consultant and real estate investor, along with his life-long study of the Austrian School of Economics, to the table in his book. When the book arrived, I started reading it cover to cover immediately. It made incredible sense to me, but sounded like it might be too good to be true. So I gave it to my husband Larry and asked him to read it and see if he could poke any holes in it. Larry said he could not, though we debated it for days. Then we decided to give the Infinite Banking strategy a test drive to see if it was everything it was cracked up to be. The Infinite Banking Concept® relies on dividend-paying, permanent life insurance – and more specifically, dividend-paying whole life insurance, which comes with more guarantees than any other type of permanent or cash-value life insurance. Some years earlier, my husband and I had each purchased a dividend-paying whole life policy, and from time to time, we had borrowed against our cash value to cover unexpected expenses. Unfortunately, however, the life insurance agent who sold it to us never impressed on us the importance of paying back our policy loans. We figured that since it was our money, and there was no requirement that we pay back the loans, why bother? It’s a reference to Nelson’s analogy that if you owned a grocery store, it’s very common to not pay anything for the groceries you take home for your family’s own use. After all, it’s your store, so you can do whatever you want, right? But Nelson demonstrates how that’s like stealing from yourself, and shows how you could come out ahead by paying for those groceries. It turns out that borrowing from your dividend-paying permanent life insurance policy works the same way. You do pay interest on your policy loans, but that interest ultimately benefits you, the policy owner, through a combination of guaranteed annual increases, plus any dividends the company pays. What’s more, when you pay back your policy loans – which is like paying yourself back – you end up with all that money back in your policy to use again – to purchase cars, to pay for vacations, to start or grow a business, to pay for a college education… or anything else your heart desires! The exception, of course, is that when you’re ready to start taking passive or retirement income from your policy, you generally don’t pay back those loans. To find out how this process actually works, we tested it out for ourselves. We were due to trade in my car for a new one. I had enough in my dividend-paying whole life insurance policy to pay cash for the car. Wow! It was so easy! No nosey credit application, no credit check, no nothing! And in five days, the money was in my checking account. As a cash buyer, I was in the driver’s seat (pun intended), when it came to negotiating the best possible deal at the car dealership. I did get a great deal on my new car. And – for the first time in my life – I received immediate title to my car. Following Nelson Nash’s guidance, I immediately also set up an automatic repayment schedule with the life insurance company to pay back the loan – on a schedule of my choosing – not a finance company’s schedule. I knew that if Larry and I had a tough time financially during the loan pay-back period, we could reduce or even skip some payments. And if we did, there would be no black marks on our credit reports, no late fees, and no collection calls or dunning notices. It was an amazing feeling of freedom and power. It’s hard to describe just how good it feels. When you “become your own banker,” you’ll understand. Once my car loan had been paid back in full, with an interest rate and on a schedule of my choosing, I realized that I had recaptured all the money I paid for the car, plus all the interest I had paid to the insurance company for the loan, back into my policy! And now, I could turn around and take another policy loan to buy my next car, take a vacation, or whatever I wanted! In the past, when I financed a car through a finance company, after I paid back the loan, all I had to show for it was a used car, worth whatever its trade-in value might be. All the principal and interest payments went to the finance company, never to be seen again (at least by me). That’s when I realized that saving up money in a dividend-paying whole life policy first, and then using policy loans to finance major purchases, beats financing them, leasing them, or even directly paying cash for them! If I had saved up money in a savings account, when I had enough money in it to pay cash for a car, I’d have had to cash out my savings and then I’d be earning zip on that money! Infinite Banking Works Because You Finance Everything You Buy! Nelson Nash opened my eyes to this important – but largely ignored – money truth. You see, you either pay interest when you finance or lease things… OR you lose the interest and investment income you could have earned, had you kept your money invested instead. Financing big-ticket items through a dividend-paying whole life policy solves the problem of constantly interrupting the growth of your money whenever you use or invest it. If your policy is from the right company, when you take a policy loan, the policy continues to grow as though you never touched a dime of it! However, only a handful of life insurance companies offer policies with this feature, so be sure your policy is with one of them. Learn more about the companies that offer policies with all the features needed to maximize the power of the Infinite Banking Concept. Do you have questions about how policy loans work, and how the interest you pay ultimately benefits you, the policy owner? Get answers to all your questions in our Consumer’s Guide to Policy Loans right here. As I mentioned, my introduction to Nelson Nash and Infinite Banking changed my life for the better. I call the concept “Bank On Yourself” and have written two New York Times best-selling books on the topic. 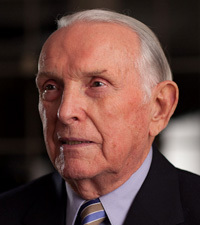 But Nelson Nash missed several critical points with the Infinite Banking Concept®. I discuss what Infinite Banking and Nelson Nash missed in this article. 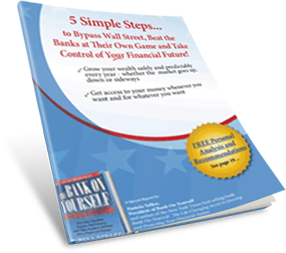 FREE REPORT REVEALS 5 SIMPLE STEPS TO FIRE YOUR BANKER AND TAKE CONTROL OF YOUR FINANCIAL FUTURE! Learn more about how the Infinite Banking Concept® works, and how it also lets you bypass Wall Street and grow your wealth safely and predictably – even when the market is tumbling. Just click here to download my FREE Report AND get a FREE chapter of my book.